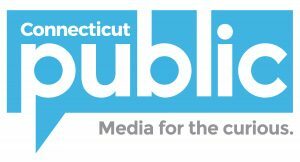 This week, we have updates from New England News Collaborative reporters on the impact of President Donald Trump’s executive order temporarily banning travel from seven majority Muslim countries. Another executive order is aimed at punishing so-called “sanctuary cities” — municipalities that refuse to detain undocumented immigrants. Our guest says that’s just the first of many battles we’ll see between cities and the Trump administration. And we hear about a program at a rapidly-diversifying New Hampshire high school that aims to build understanding between American-born students and newcomers. The first few weeks of the Trump administration have created confusion for thousands of New Englanders and their loved ones overseas. A ban on travel for refugees and all those traveling from a small group of mostly Muslim countries meant that students studying here on visas might not be able to return to their classrooms in America. It meant long journeys for families fleeing the civil war in Syria. And it meant an indefinite hold on plans to resettle refugees in places like Rutland, Vermont and Northampton, Massachusetts. A judge in Seattle issued a temporary restraining order against the executive order, allowing travel from the seven countries and refugee entry to resume. The federal government challenged the restraining order. An appeals court ruled Thursday not to overturn the lower court’s order. Trump indicated that he will appeal that ruling. 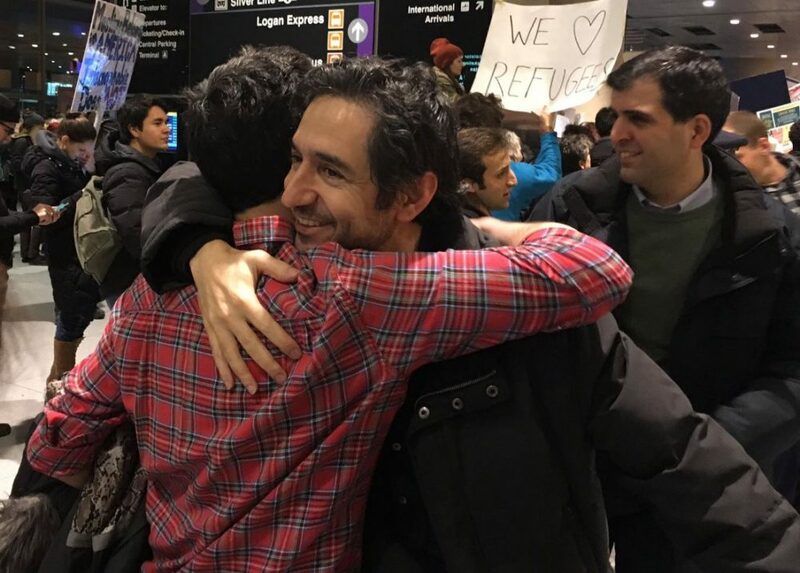 New England Public Radio’s Jill Kaufman has been covering the story of a UMass graduate student from Iran who got stuck while trying to return to the United States. 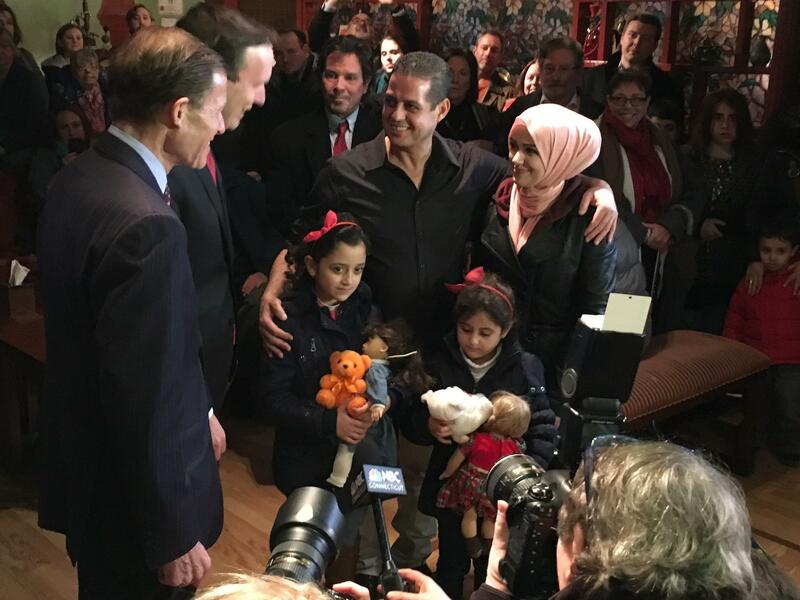 While judges were deliberating whether to halt the travel ban last week, both Connecticut senators intervened after a Syrian mother and two daughters were kept from landing at JKF airport, as WSHU’s Cassandra Basler reports. And from New Hampshire Public Radio, Emily Corwin brings us the perspectives of some Granite Staters who support the immigration restrictions. 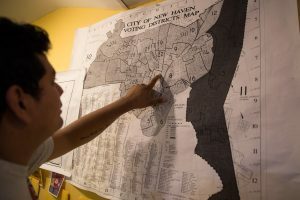 Immigration rights activist Jesus Sanchez looks at a map of New Haven, one of Connecticut’s “sanctuary cities.” Photo by Ryan Caron King for WNPR. At a briefing this week, White House Press Secretary Sean Spicer said that Trump plans to make good on another immigration-related executive order: the one that cuts off funds sanctuary cities. The president has said that sanctuary cities “breed crime,” but there appears to be no evidence to support that claim. Also this week, the Massachusetts cities of Chelsea and Lawrence, both home to large immigrant populations, filed suit against the president saying the order violates the constitutional principles of federalism and separation of powers. The mayors of Boston and Hartford have said their cities won’t comply. And despite the federal threats, even smaller communities like Newton, Massachusetts are considering sanctuary city status. In a recent article in Governing magazine, our guest Alan Greenblatt writes that the fight over this executive order is just the first of many flash points to come between cities and the Trump administration. And he sees a further widening of the divide between metro areas and rural areas in the United States. Ten years ago, the demographics of New Hampshire and of Concord High School were almost identical. Both were 93 percent white. While that number has remained steady for the state, the capital city’s high school has diversified in a big way. Today more than 10 percent of the school’s 1,600 students are, or were, refugees resettled from 66 countries. 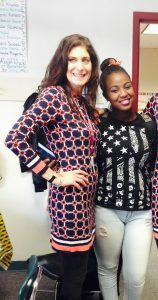 Anna-Marie DiPasquale, the school’s social worker, started a new project this past fall called Travel around the World. 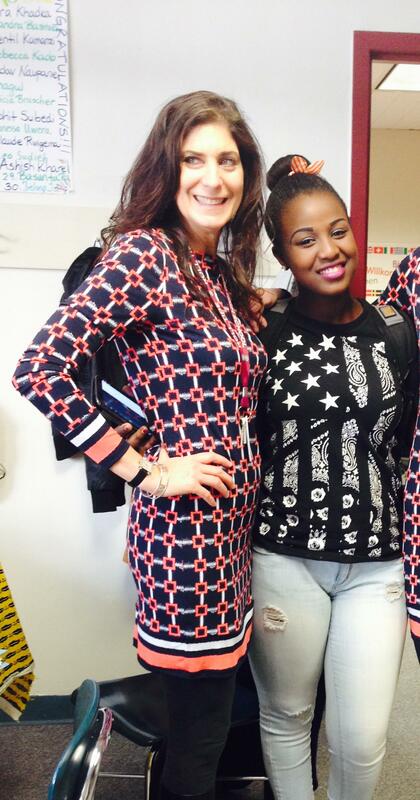 The project allows Ms. DiPasquale to visit different classrooms with small groups of refugee students sharing their cultures and traditions firsthand. From New Hampshire Public Radio’s Word of Mouth, Jimmy Gutierrez reports. We appreciate your feedback! Send praise, critique, suggestions, questions, and story leads to next@wnpr.org.